My art practice actively engages with scientific data and processes as well as sonic visualisations through sited acoustic experimentation. Interactive installations created since 2010 have involved researching live sonic processes made visual through the use of sound emission analysers. Other installations have responded to recordings of electro-acoustic phenomena received from outer space as well as online NASA archive footage. Technologies can transform data to allow a heightened awareness of sonic phenomena through visualisation. Yet historic data where recording technologies were far less advanced than at present emphasize more liminal states of being. In 1972, the Apollo 17 mission to the Moon included the first scientist-astronaut, Harrison Schmitt, with a PhD in Geology. 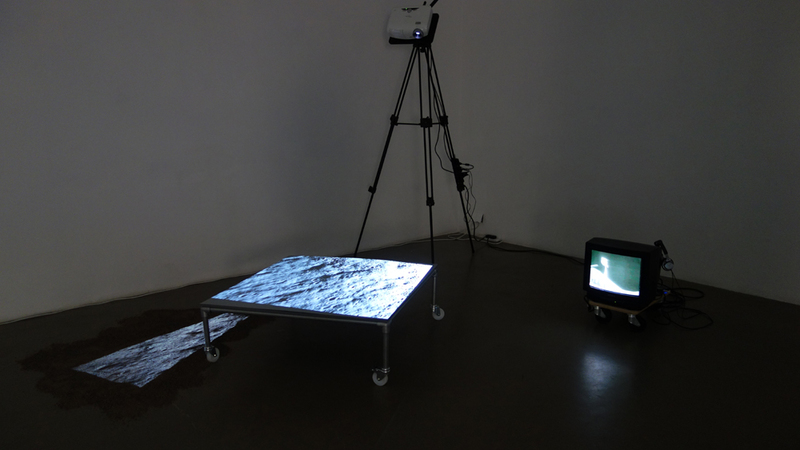 The installation will include original footage of Schmitt's regolith discoveries in the volcanic Taurus-Littrow Valley, contrasted with footage from recent LROC lunar flyovers projected onto ground basalt. The lunar regolith is primarily composed of basaltic and anorthositic rock, disintegrated through continuous bombardment by interstellar charged atomic particles and meteoric impacts. Technological advancements in cameras can make the lunar surface seem less real, or rather more virtual than the hazy 1972 footage. Schmitt's zero-gravity excitement at finding orange soil is palpable through the grainy moon-dust covered camera lens. The Outer Space Treaty of 1967 claims that all outer space is an international commons and it forbids all nations from claiming territorial sovereignty. The Moon Treaty of 1979 states that 'the Moon and its natural resources are the common heritage of mankind and that an international regime should be established to govern the exploitation of such resources when such exploitation is about to become feasible' (http://www.unoosa.org). Yet since 2017, Trump's agency review team (ART) have been in discussion with NASA about mining possibilities. Trump's resistance to the globally agreed aims of both treaties, through potential commodification of the Moon's assets, resonates with aspects of the Permittivity of Free Space i.e. the resistance that material has to the flow of electricity and also applies to the vacuum of space. Initially graduating from Canterbury College of Art in 1983 with a BA in Fine Art, later studies have included an MA in Contemporary Art Theory at Goldsmiths 2009-11 and an MA Art & Design Education at the Institute of Education 2006-8. My installations have been exhibited widely including during Venice Biennales 2013 and 2017, The Hermitage in St Petersburg 2015, as well as in many European cities. Currently an active member of UAL's Digital Maker Collective, I have worked collaboratively with two Tate Exchange projects during 2017 and 2018.